DAYTONA BEACH, Fla. – The first day of on-track activity at the Roar Before the Rolex 24 At Daytona was a busy one, with practice sessions for the IMSA WeatherTech SportsCar Championship and IMSA Michelin Pilot Challenge, in addition to practice and qualifying for the IMSA Prototype Challenge. The event continues through Sunday at Daytona International Speedway. On the racetrack, Oliver Jarvis posted the fastest time in WeatherTech Championship practice in the No. 77 Mazda Team Joest Mazda RT24-P Daytona Prototype international (DPi) entry. Jarvis’ best lap of 1 minute, 35.989 seconds was quicker than the existing WeatherTech Championship track record of 1:36.083 set by Renger van der Zande in the No. 10 Konica Minolta Cadillac DPi-V.R in Rolex 24 At Daytona qualifying last year. 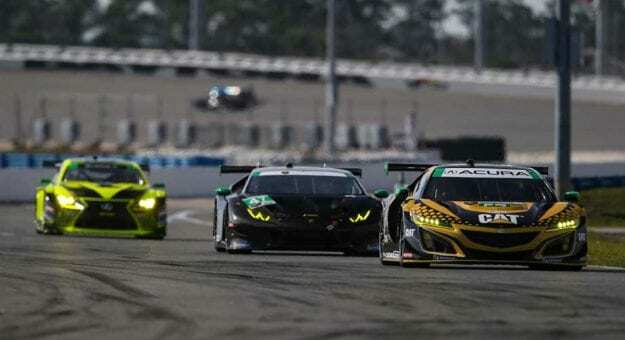 While Jarvis’ quick lap in the DPi class came in the first of two WeatherTech Championship sessions, the fastest times in the other three classes all were posted in the second practice, despite heavy rains that abbreviated the session. Gabriel Autry led LMP2 with a lap of 1:39.575 in the No. 52 PR1/Mathiasen Motorsports ORECA, with Davide Rigon leading the way in GT Le Mans (GTLM) in the No. 62 Risi Competizione Ferrari 488 GTE at 1:44.718. Jeroen Bleekemolen led GT Daytona (GTD) at 1:46.452 in the No. 33 Mercedes-AMG Team Riley Motorsports GT3.